I want to have a beautiful garden. I love flowers, especially the sweet smell of old-fashioned roses. I'm getting better at growing roses, this is from a pot on my patio. I love freshly grown tomatoes and corn and strawberries. I come from farming stock. My great-grandmother worked a farm and then a decent sized backyard garden until she was in her early 90's. She was an amazing woman, who survived an alcoholic husband and really hard years. She lived in an old farmhouse near the Eastern Shore of Maryland and worked seventy odd acres of land and raised chickens. She didn’t have indoor plumbing, just running water in her sink and an icebox for her food. Her pantry was chock full of canned vegetables and glass Mason jars of homemade jam. I have very fond memories of visiting her on family vacations. Her house always smelled wonderful. We’d come in and she’d whip up custard style cornbread in a beat up metal mixing bowl. She never measured ingredients, just tossed everything in and whipped the corn meal, eggs, sugar and evaporated milk and then poured the batter in the pan. While the bread would bake, she’d sit down at her old kitchen table with a mason jar of wildflowers in the center. She’d pour a cup of coffee and then set the cup in a ceramic bowl and add cream until the coffee overflowed into the bowl and the drink was the color of caramel. We would gab about life, waiting impatiently for the bread to be done while she slurped up her coffee in great big gulps. 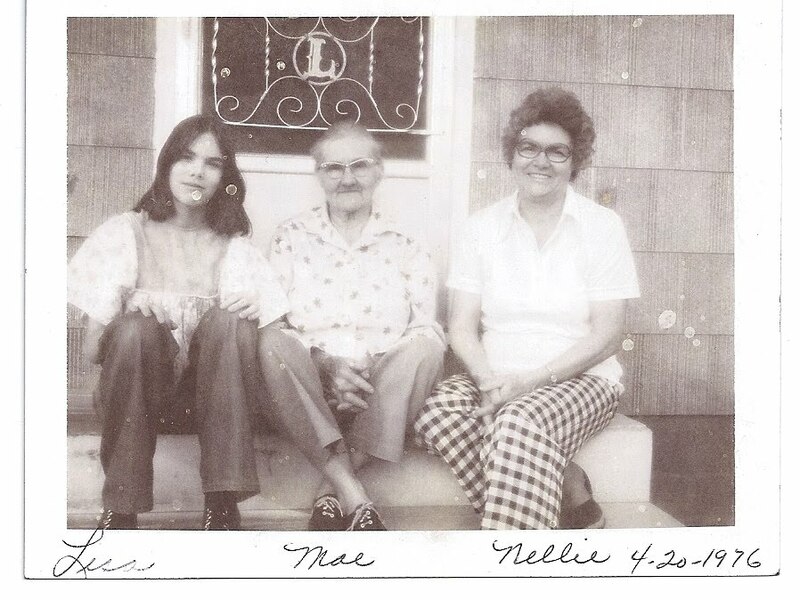 Me at thirteen, with Ma Mae Littleton in the middle, and her daughter, Nellie, my grandma on the right. My planter boxes from last year, I haven't quite gotten the vegetables in the ground this year...soon. Somehow the time to make my garden really shine never comes. I spend a lot of time with my kids or at their sports or various other activities or just hanging out with them. I finally realized that I know the time with my kids is precious and I need to savor every moment. I’ll have time to work a garden after I’m done growing my children. And I hope both do her proud. What a beautiful story! I adore these little glimpses into our personal histories ;-) Seems to me one of the best things about gardening is that it does tend to link us to history, as well as the future. Lovely! And I like the conclusion you reach -- you'll grow your Real garden later -- this is just the placeholder for it, the honoring of your g-grandmother. Oh, Lisa, what a delightful post. :) I can't help thinking a garden of children is the perfect image for your life. And I love the connection through time with your g-grandmother. She sounds amazing.